On November 8, half the country thought the Presidential election was going to be a photo finish. The other half thought the election was a shoe-in for Secretary Clinton. Amazingly, both camps were wrong. Donald Trump won by a landslide and will now become America’s 45th President. Although a well fought fight by Hillary Clinton, the disillusionment about not winning prevented her from addressing her own campaign crowd. Many are speculating on what actually happened. How could the media have gotten so far off track that they missed the Trump Train heading into the station? Truth be told, skewed polls that heavily favored Democrats, along with lackluster reportage on the impact Donald Trump was having nationwide at his rallies, led to false assumptions. Prior to the election, pollsters and pundits alike gave their opinions and stats, but perhaps, should have added the caveat that Trump was a wildcard. Not being a typical politician, he could not be sunk the usual way, and therefore, should not have been underestimated. Many times, Trump challenged the “corrupt” media as he liked to call them, to turn their cameras to show the size of his audiences, but they did not. It is apparent that the media missed the fact that at least half of the American people were angry and desirous of change. Perhaps the answer to the puzzle is media elitism; the fourth estate no longer answers to the people. Whatever the case, I don’t think I have ever seen the media more stunned than they were last night. 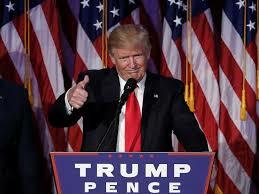 Their sober faces and quieter tones were quite noticeable as the election results came in, state after state for Donald J. Trump. Did we learn anything from this difficult and what seemed like a never-ending political season? I think both sides learned something. The Republican side re-connected with Joe the Plumber, the regular worker, and offered him change, leading to Presidential victory. The Democratic side learned that more of the same kept their constituency, but did not grow their base. Although both candidates had their flaws, one was able to reach across the aisle and connect with many, whom the media and the political class left behind. This stunning upset was the first of its kind in a Presidential race in 30 years! Perhaps the media learned something as well. Misleading the people does not pay. Had they treated Trump with some measure of fairness, the race results may have ended differently. Hopefully, the pollsters learned something about their inaccurate figures, as it is obvious that they embellished many of their results to make Clinton look better in the polls, thus hoping to discourage Trump voters. Lastly, what about the forlorn faces at Clinton’s victory headquarters? Mostly female, the crowds of old and young alike, sat stupefied at what they were seeing in the way of election results. These hardworking, loyal supporters were in a state of shock, much because of the inaccuracies they heard and saw as put forth by the media.